French soldier in the Carlist expedition against Madrid in 1837; distinguished for bravery and remarkable devotion to Boulan de Brie, a lieutenant in the regiment in which he served. When De Brie was mortally wounded Benjamin carried him first from the field of battle, and afterward from the hospital where he had been left at the mercy of the enemy after the Carlists' hurried departure from Huesca. De Brie died in Benjamin's arms; and the faithful servant, gratefully remembering the kindness with which he had been treated by the lieutenant's wealthy mother, was disconsolate, and exposed himself recklessly in the most dangerous engagements, performing remarkable acts of valor. 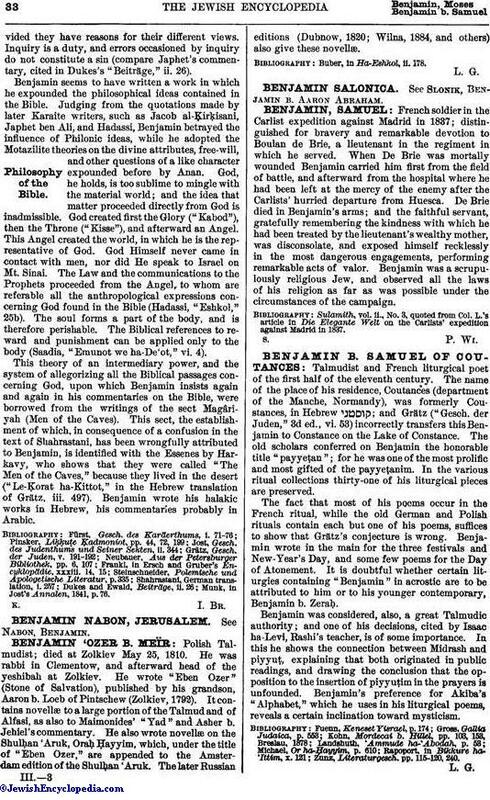 Benjamin was a scrupulously religious Jew, and observed all the laws of his religion as far as was possible under the circumstances of the campaign. Sulamith, vol. ii., No. 3, quoted from Col. L.'s article in Die Elegante Welt on the Carlists' expedition against Madrid in 1837.